Let's create global disaster safety map! To achieve this goal, we plan this program. Disaster management has four phases; mitigation, preparedness, response, and recovery/reconstruction. Mitigation and preparedness are phases before disasters occur and response and recovery/reconstruction are phase after disasters. Mitigation means not causing any damages. Preparedness means preparation something for the time when people take damages. Response means evacuation or rescue soon after disasters occur. And recovery/reconstruction means rebuilding or improving social and natural environment than states before disasters. In the Great Hanshin-Awaji Earthquake of 1995, more than 80% of dead people lost their lives because of collapse of their houses. For dead people by fire, they lost their lives because they could not evacuate or be rescued from collapsed house. Thus, it seems that earthquake-proof houses are most important factor to reduce damages. Making earthquake-proof houses is identified as mitigation. In this earthquake, many peoples were rescued by neighbors. Almost 60% of dead people lost their lives in 15 minutes since the earthquake occurred. Developing community rescue system is also measures for disaster reduction and it is identified as preparedness. From lessons of the Great Hanshin-Awaji Earthquake, measures before disasters (mitigation and preparedness) is more important and mitigation should be emphasized more than other phase of disaster management. The present disaster education in Japan mainly consists of evacuation training or disaster training. This is identified as response. For information related to disasters from mass media, contents are mainly emergency bag or training. Thus, it seems that awareness to emphasize mitigation is lack in the society. Global Disaster Safety Map Project (GDSMP) is the project that students learn past disaster and present states of disaster management in their community, image problems when disasters occur, and think measures for mitigation and preparedness. 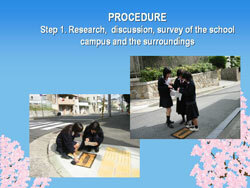 This process is implemented by students’ discussion using map around their school. Finally specific measures for mitigation and preparedness are written by students on the map and the map is finalize as community disaster safety map. The map of each school is joined and the joined map become disaster safety map in the world, in turn, Global Disaster Safety Map. A teacher of each school decides disaster out of many types of natural disasters which has probability to occur around school. It is possible to choose some disasters. Students and teachers learn past disasters which occurred in students’ country or community. For ways to learn, each school decides but following show how to collect information. Following are contents to learn. Teacher can increase contents accordingly. Size of map is about 2m x2m. Teachers can blow up some maps and connect them. Students and teachers check following contents. They make in these contents into the map, using some colors. Students and teachers check following contents. They check them on the map or put objects on the map to understand human and material resource easily. If needed, fieldwork is implemented. 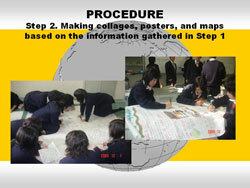 Based on disaster learning and made map, students and teachers discuss damage in disasters. If school can get information of expected damages, they can refer to it. Damages are colored up on the map. Season and time disaster occurs is decided accordingly. Students can understand seriousness of damages if teacher sets season and time that damages is larger. Students and teachers discuss following contents. They image states during and soon after disaster and anticipate whether not only each of them but also family or community members can evacuate and whether organization related to disasters can come to affected area, using information on the map. Based on Step 5, students and teachers discuss problems. Teachers need to let students know importance of taking measures before disasters. Students and teachers image livelihood after disasters and in recovery/reconstruction and discuss its problems. They write the problems in the map. Students and teachers discuss measures people can take in personal, family, and community level. And they write the measures in the map. Measures in this step means mitigation and preparedness but teachers are requested to emphasize the former one. Following shows schedule of GDSMP. The number in parentheses means hour needed in each step in disaster learning and making disaster safety map. 50 minutes is 1 hour in this schedule. Showed hour in this schedule is minimum hour needed and each school can increase hour in each step. It is hoped that schools use time after school or on Saturday and get more time to implement. Teachers decide disaster before students starts this project. Hour in this step is used for summing up information which students and teachers collect have collected from survey or interview, and don’t include time for interview to family or community members.